Home / Food Prep / Fruit, Vegetable and Salad Preparation / Salad Dryers and Spinners / Zyliss E940001U Easy Spin Large Salad Spinner, 10"
Make drying your salad ingredients easy with the Zyliss E910009U Zick-Zick Classic Food Chopper. Zyliss has engineered a high-performing innovative glide wheel motion that results in smooth operation and a consistent, fast movement effectively drying and fluffing greens and herbs. Model includes an approved ergonomic handle design and break button with quick braking action to fluff salad. 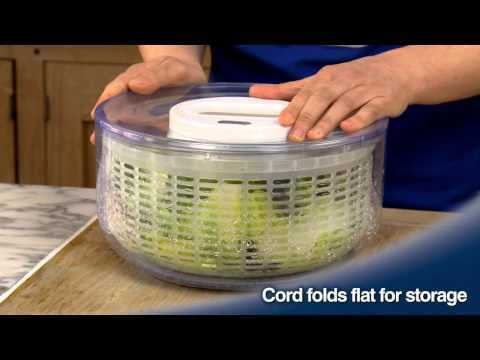 To operate this salad spinner, simply rotate the handle on top and in seconds you'll have a bowl of dry, soggy-free greens. This spinner features a removable colander and a multipurpose bowl to keep your greens separate from the excess water. This product measures at 5.38 inches high with a 10.25 inch diameter. Dishwasher safe.